Semiconductors–a class of materials that can function as both electrical conductor and insulator, depending on the circumstances–are an essential technology for all modern electronic innovations. Silicon has long been the most famous semiconductor, but in recent years researchers have studied a wider range of materials, including molecules that can be tailored to serve specific electronic needs. Perhaps appropriately, one of the most cutting-edge electronics–supercomputers–are indispensable research tools for studying complex semiconducting materials at a fundamental level. Recently, a team of scientists at TU Dresden used the SuperMUC supercomputer at the Leibniz Supercomputing Centre to refine its method for studying organic semiconductors. Specifically, the team uses an approach called semiconductor doping, a process in which impurities are intentionally introduced into a material to give it specific semiconducting properties. It recently published its results in Nature Materials. "New kinds of semiconductors, organic semiconductors, are starting to get used in new device concepts," said team leader Dr. Frank Ortmann. "Some of these are already on the market, but some are still limited by their inefficiency. We are researching doping mechanisms–a key technology for tuning semiconductors' properties–to understand these semiconductors' limitations and respective efficiencies." When someone changes a material's physical properties, he or she also changes its electronic properties and, therefore, the role it can play in electronic devices. Small changes in material makeup can lead to big changes in a material's characteristics–in certain cases one slight atomic alteration can lead to a 1000-fold change in electrical conductivity. While changes in material properties may be big, the underlying forces–exerting themselves on atoms and molecules and governing their interactions–are generally weak and short-range (meaning the molecules and the atoms of which they are composed must be close together). To understand changes in properties, therefore, researchers have to accurately compute atomic and molecular interactions as well as the densities of electrons and how they are transferred among molecules. Introducing specific atoms or molecules to a material can change its conducting properties on a hyperlocal level. This allows a transistor made from doped material to serve a variety of roles in electronics, including routing currents to perform operations based on complex circuits or amplifying current to help produce sound in a guitar amplifier or radio. Quantum laws govern interatomic and intermolecular interactions, in essence holding material together, and, in turn, structuring the world as we know it. In the team's work, these complex interactions need to be calculated for individual atomic interactions, including interactions among semiconductor "host" molecules and dopant molecules on a larger scale. The team uses density functional theory (DFT)–a computational method that can model electronic densities and properties during a chemical interaction–to efficiently predict the variety of complex interactions. It then collaborates with experimentalists from TU Dresden and the Institute for Molecular Science in Okazaki, Japan to compare its simulations to spectroscopy experiments. "Electrical conductivity can come from many dopants and is a property that emerges on a much larger length scale than just interatomic forces," Ortmann said. "Simulating this process needs more sophisticated transport models, which can only be implemented on high-performance computing (HPC) architectures." To test its computational approach, the team simulated materials that already had good experimental datasets as well as industrial applications. The researchers first focused on C60, also known as Buckminsterfullerene. Buckminsterfullerene is used in several applications, including solar cells. 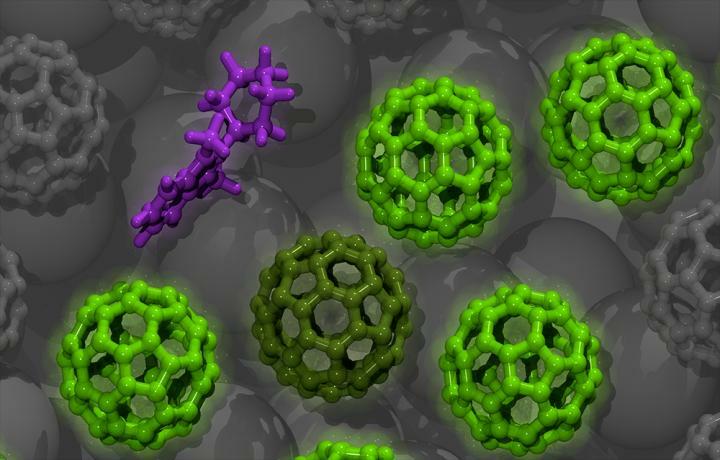 The molecule's structure is very similar to that of a soccer ball–a spherical arrangement of carbon atoms arranged in pentagonal and hexagonal patterns the size of less than one nanometer. In addition, the researches simulated zinc phthalocyanine (ZnPc), another molecule that is used in photovoltaics, but unlike C60, has a flat shape and contains a metallic atom (zinc). As its dopant the team first used a well-studied molecule called 2-Cyc-DMBI (2-cyclohexyl-dimethylbenzimidazoline). 2-Cyc-DMBI is considered an n-dopant, meaning that it can provide its surplus electrons to the semiconductor to increase its conductivity. N-dopants are relatively rare, as few molecules are "willing" to give away an electron. In most cases, molecules that do so become unstable and degrade during chemical reactions, which in this context can lead to an electronic device failure. 2-Cyc-DMBI dopants are the exception, because they can be sufficiently weakly attractive for electrons–allowing them to move over long distances–while also remaining stable after donating them. The team got good agreement between its simulations and experimental observations of the same molecule-dopant interactions. This indicates that they can rely on simulation to guide predictions as they relate to the doping process of semiconductors. They are now working on more complex molecules and dopants using the same methods. Despite these advances, the team recognizes that next-generation supercomputers such as SuperMUC-NG–announced in December 2017 and set to be installed in 2018–will help the researchers expand the scope of their simulations, leading to ever bigger efficiency gains in a variety of electronic applications. "We need to push the accuracy of our simulations to the maximum," Ortmann said. "This would help us extend the range of applicability and allow us to more precisely simulate a broader set of materials or larger systems of more atoms." Ortmann also noted that while current-generation systems allowed the team to gain insights in specific situations and prove its concept, there is still room to get better. "We are often limited by system memory or CPU power," he said. "The system size and simulation's accuracy are essentially competing for computing power, which is why it is important to have access to better supercomputers. Supercomputers are perfectly suited to deliver answers to these problems in a realistic amount of time." This research used Gauss Centre for Supercomputing resources based at the Leibniz Supercomputing Centre.